The Suunto brand took off after the release of the groundbreaking Suunto Vector, the first outdoor computer watch to feature an altimeter, barometer, compass, and thermometer all in one. Suunto has come a long way since then however and in 2007 they unveiled the award-winning Suunto Core. The Suunto Core has historically been one of the more popular computer military watches and continues to show popularity over a decade after its release. This timelessness in a technology-based gadget is impressive and is testimony to the innovative designers at Suunto. So what is it that makes this watch so appealing? Is it its stylish design? Its durability features? Its range of powerful tools? Well, the answer is not one, but all of these features. There are few watches out there which manage to incorporate so many features an outdoors person needs with such seamless quality and the few that do tend to be very expensive. In this Suunto Core review, we will take a look at some of the best features that this watch has to offer. Suunto says the barometer on the Core is capable of predicting stormy weather up to 2 hours before it hits and will alert you through an innovative new feature called the “intelligent storm alarm”. This feature is activated by a rapid drop in air pressure over a period of 3 hours and will notify the user by sounding an alarm and flashing. During an expedition, this feature could be of utmost importance for ensuring that you find or build a shelter before a storm hits. The alarm function can, of course, be switched off. Built into this watch is a weather trend indicator which uses recorded data from the barometer over the past 3-6 hours and analyses this data to provide a prediction of the weather to come. This is a fantastic feature for outdoors-people who need to know what gear to wear on a given day. The altimeter on this watch can not only measure your elevation up to 30,000 ft, but can also record how far you have climbed or descended and record this information for future analysis. Without a battery draining GPS, this is a very useful feature for mountaineering and hiking in order to track your location on a topographical map. The altimeter also includes a unique feature called a “start-from-zero function”, which allows you to track your ascent/descent without knowing your current altitude. One of our favorite aspects of the Suunto Core is its wide range of small user-friendly features which when combined make this watch very intuitive and simple to use. For example, the watch can sense movement in the user and will switch between displaying the barometer and altimeter accordingly. The depth meter will detect if the user is in the water and automatically switch to displaying this measurement. Other functions such as sunset and sunrise predictors can be easily reached by pressing one of the large, easy access buttons on the side of the watch. 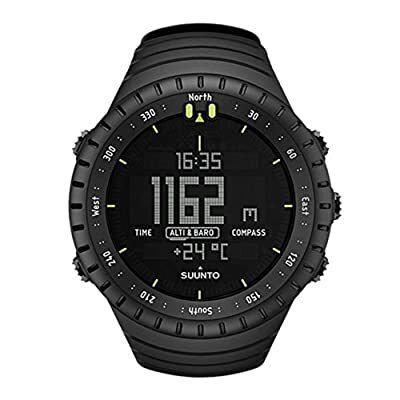 The Suunto Core also comes with many basic features of tactical watches which you would expect such as dual time display, date display, an alarm system, and multilingual functionality. Alongside the Casio G Shock range, the Suunto Core is reportedly very popular in outdoors professions. The watch is available in a range of designs to suit both your style and job. We like the matte finish black version with inverted LCD display as it gives a stealthly look, however, the Suunto Core comes in many other colors and finishes, allowing you to personalize your choice. This watch just feels right on your arm. The large bezel and bulky buttons give it a rugged feel, which juxtapositions with the immense computing power within. Certainly my favorite tactical watch. Militarywatchguide.com is a participant in the Amazon Services LLC Associates Program, an affiliate advertising program designed to provide a means for sites to earn advertising fees by advertising and linking to amazon.com. Military Watch Guide Copyright © 2019.